An enduring legend, perhaps based on a grain of fact, says that torrone (literally "big tower") was invented for a medieval wedding in the Italian city of Cremona, the candy's name based on its having been shaped into a tower as an aristocratic "wedding cake." This story does not preclude the more probable history of the confection, which some historians believe originated in ancient Greece or Rome. It has also been suggested that the very word "torrone" derives from the Arabic turun, denoting a similar confection. This theory suggests a Sicilian introduction of torrone into Europe, via the Arabs in the twelfth century or earlier, though the Greek-and-Roman theory seems the more probable explanation. Of course, it is entirely possible that similar confections were invented during the same early period in China, Persia and the Mediterranean. The simple fact is that torrone's precise origin has been lost to time. Torrone is a very simple noughat candy made from egg whites, honey, nuts (usually almonds) and --in some recipes-- cane sugar. The recipes of several popular commercial candy bars (Toblerone, Mars, etc.) are based on that of traditional Italian torrone. That's why the flavour of torrone seems familiar to many who try it for the first time after having tasted these other candies. The more honey (and the less cane sugar) that is mixed into the torrone, the softer the final product. The softer, honey-based version is the more traditional, cane sugar having been introduced in Sicily no earlier than the ninth century. Almonds are widely grown in Sicily, where pistachios are also used in torrone. 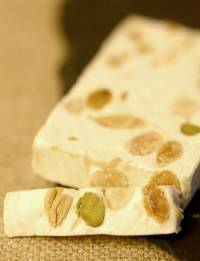 Of all the confections made in Sicily, torrone may be one of the oldest if, indeed, it was made by the ancient Greeks. The method of heating and mixing the ingredients is very important if the torrone is to be made successfully. The proportion of egg white to honey is particularly important. In the early Middle Ages, and until around 1100, what distinguished Sicilian pastries and other confections from those popular in northern Italy and most of Europe was the extensive use of cane sugar (introduced by the Arabs). Torrone was a clear exception to this rule because it was often made without the addition of cane sugar. However, it could be stored for fairly long periods. Traditional torrone isn't easy to find, either in Sicily or elsewhere. One of the best sources is Maria Grammatico's pastry shop in the western Sicilian town of Erice (at Via Vittorio Emanuele 14). Her unique torrone is a tender delight made with both almonds and pistachios. (A 200 gram piece costs €6.) The ingredients (in order of quantity) are: toasted almonds, pistachios, egg white, cane sugar, honey, flavoring (vanilla, orange, etc.). The delicious result is more than the sum of its parts. Source: Best of Sicily. Article by Roberta Gangi. Gangi has written numerous articles and one book dealing with Italian cultural and culinary history, and several food and wine articles for Best of Sicily Magazine. 1. Line a 9 x 13-inch pan with parchment paper. 2. Sprinkle a cutting board with cornstarch. 3. In a medium saucepan, combine honey and granulated sugar and put over medium heat. 4. When a candy thermometer registers 315 degrees F/157 degrees C, remove pan from heat. 5. Put egg whites in a mixer fitted with the paddle attachment. 6. Start mixer on medium. 7. When egg whites are stiff add icing sugar, scraping down the sides. 8. When the honey mixture temperature has gone down to 300 degrees F/150 degrees C, pour honey into egg whites while mixer is running. 9. Increase speed to high until mixture thickens, about 2 minutes. 10. Fold in nuts with a rubber spatula or wooden spoon. 11. Scrape mixture onto cutting board with cornstarch. 12. Knead for about 4 minutes. 13. Press mixture evenly into pan. 14. Cover with another piece of parchment and let cool. 15. Cut into 36 squares with a hot knife. I made this for a BBQ and at the end the plate was clean! Simply delicious, but it took quite a while to set.